Remember our post talking about turning our living/dining room into workshop? After a brief intermission, we’re back with an update. 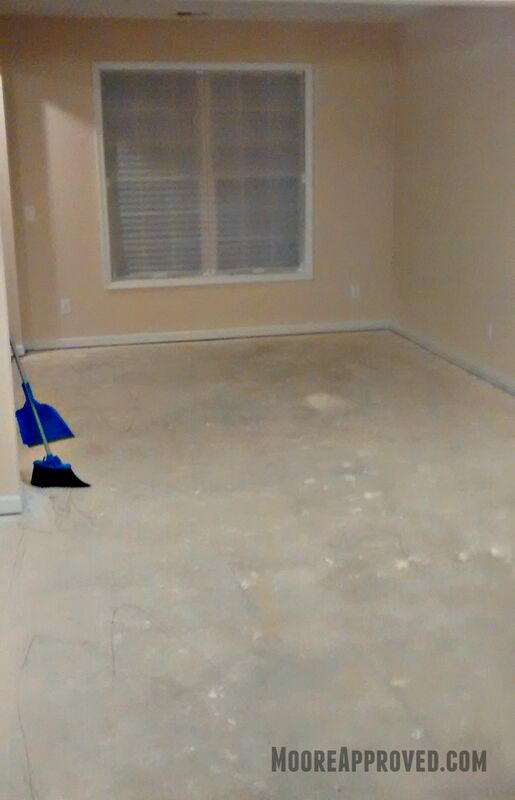 You may remember the picture of our space after the carpet and pad was removed, but there was still a massive amount of overspray from the builders as they painted the walls and trim. This was quite an issue for finishing off the floor, as it all had to go. 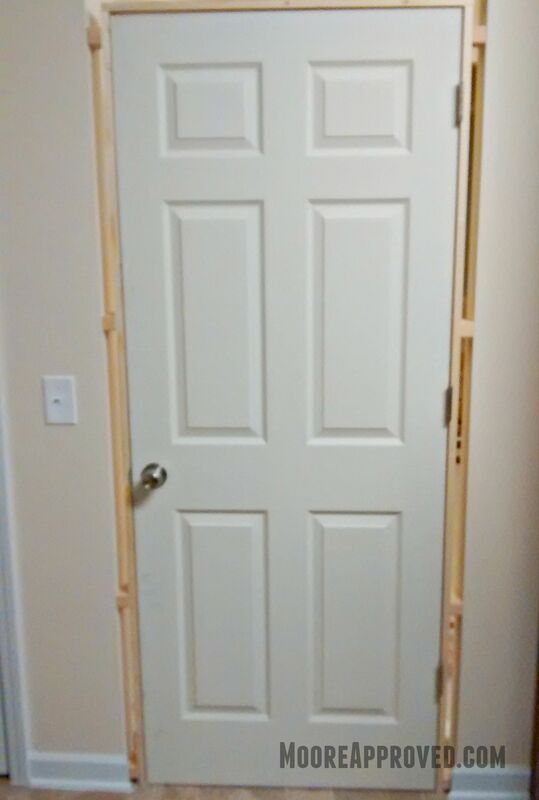 So a door frame had to be assembled and a door had to be installed to separate the future workshop from the kitchen. While sawdust may be “man glitter” it is not an acceptable seasoning. 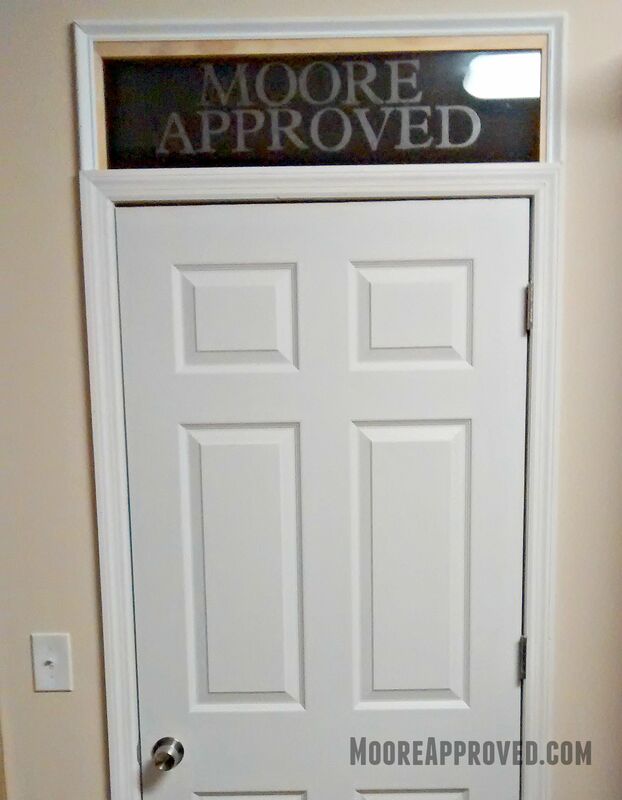 Since this is the Moore Approved workshop, I made a custom etched glass transom window for over the doorway. The next step was to remove all of the paint overspray and adhesive using a Clarke American Sanders Floor Maintainer and Diablo non-woven black buffer pad rented/purchased from The Home Depot. 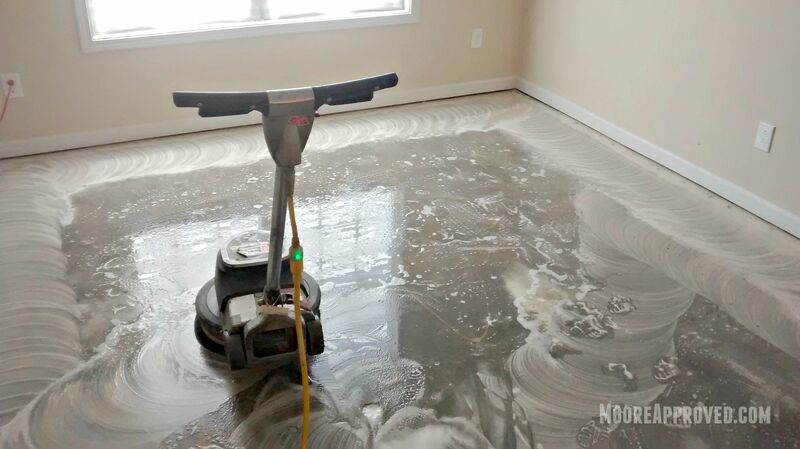 This was an exceptional value, because purchasing a floor buffer or maintainer would be extremely costly for infrequent use. In certain areas, scraping may be required where dense overspray cannot be dislodged with the cleaner and floor maintainer alone. There are other options for removal but because we live here we did not want to be exposed to volatile chemicals or fumes. 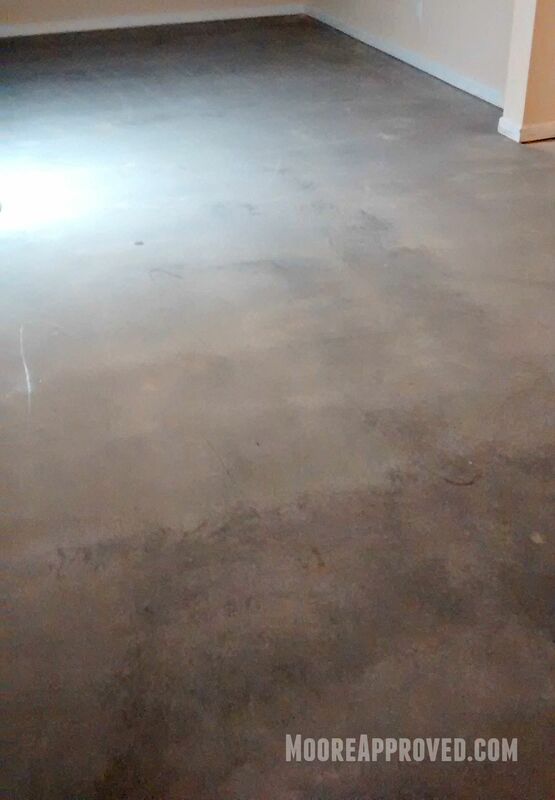 If this project is done in a garage, there are other products available that will instantly strip your concrete floor. 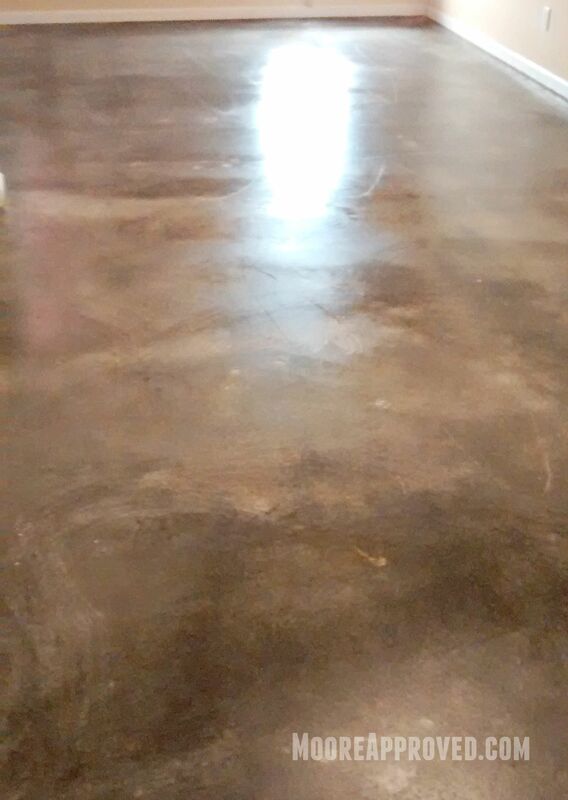 Then after a few cleansing coats of water, you’re good to go and won’t need to rent the floor maintainer for cleanup. I applied Stain Resistant Floor Sealer and High Traffic Floor Polish with a rayon mop head and waited at least 30 minutes between each application of the sealer to prevent hazing. I waited an hour in between each application of the wax. DO NOT USE fans to dry, as these applications need time to cure. The process I followed was applying three coats of sealer (letting it dry completely between coats), four layers of wax and then using a Diablo non-woven red buffer pad for the final buffing. If you have access to a high speed buffer you’d want to use a white or neutral buffing pad to bring out that showroom quality polish. Be sure when applying the sealer and polish – that it’s in a figure 8 motion overlapping each time as you move across the floor, ensuring an even finish and maximum shine. 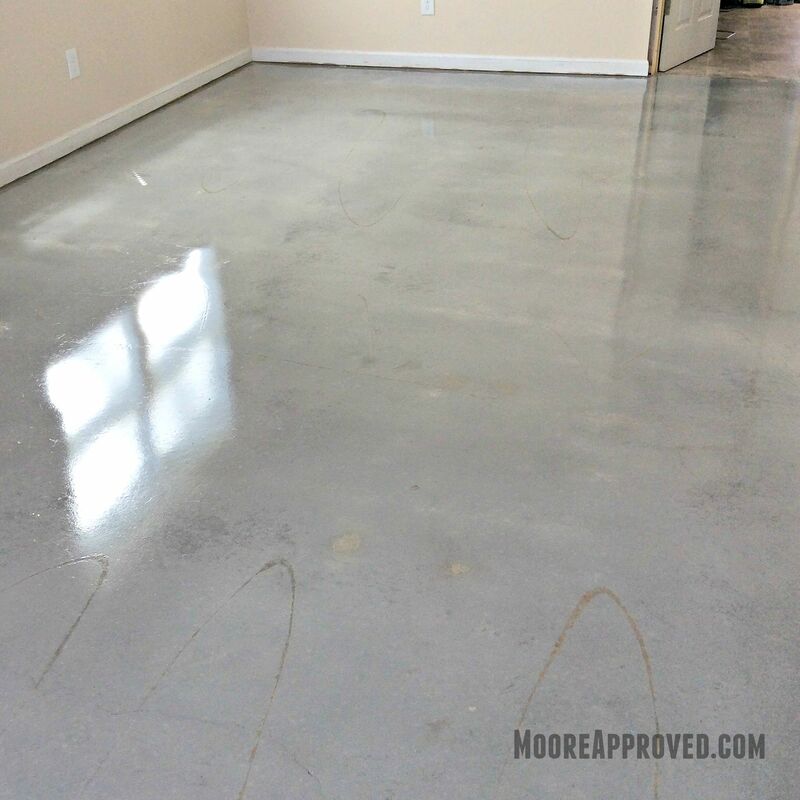 The first coat of sealer will give the concrete a much darker tone then it will end up with, so don’t freak out when you first see that. 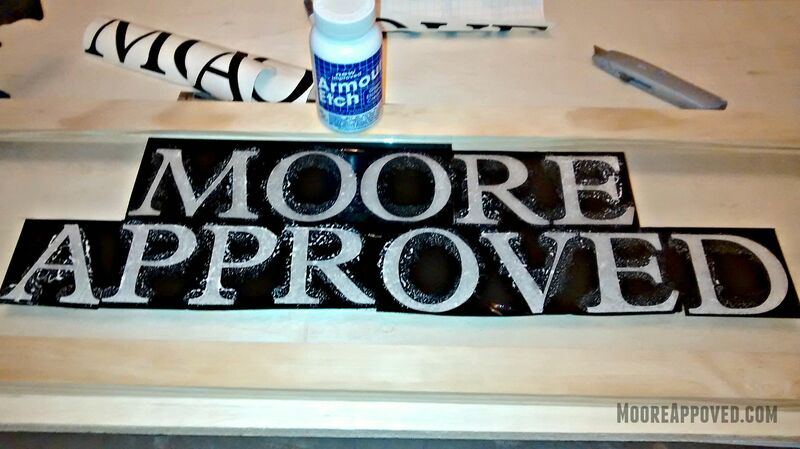 Make sure to follow the instructions on the back of the bottles for both the floor sealer and polish and you should be able to achieve exceptional results. 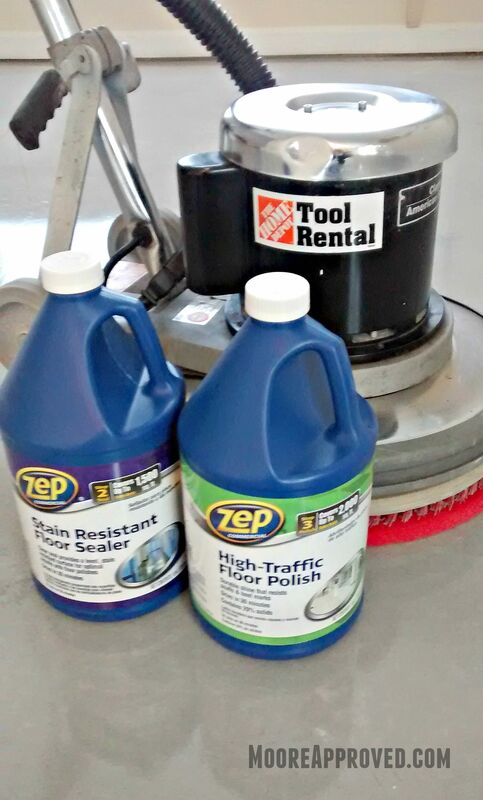 TIP: These floor maintainers and polishers are meant to be balanced. If you’re fighting it too much, you’re putting pressure in the wrong areas which means you have to jerk it back to where you want it to go. For individuals who are not Arnold Schwarzenegger, this may be an issue and you could end up damaging trim, painted surfaces, walls, doors, yourself, or someone else. So start in the center of the room until you feel comfortable with the machines operation. Also, If you are using the maintainer to clean the floors as we did, you have to use a sufficient amount of liquid to get things going or you will be sorry when you press the “ON” switch. Whatever you do: Just don’t let go of the handle until the machine has come to a complete stop! 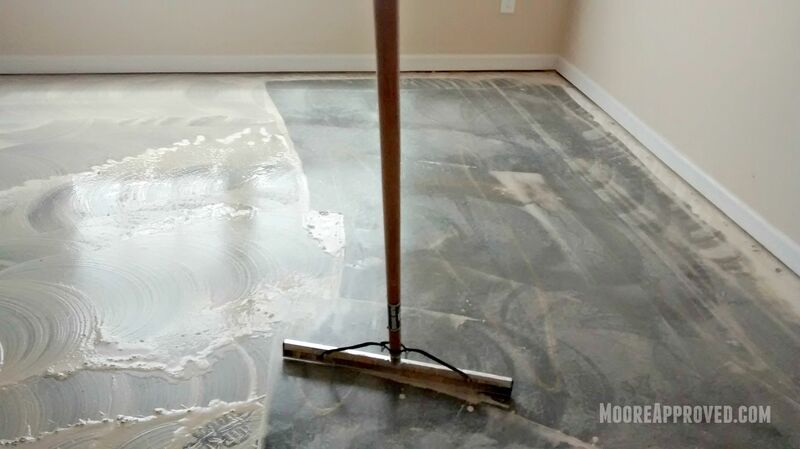 While there are a ton of treatments that one can apply to concrete we opted for this method of finishing the floor because it was cost effective and it is easily able to be stripped or removed, so the application of other flooring such as tile would not be affected. Approximate cost for everything including The Home Depot tool rental was less than $300. 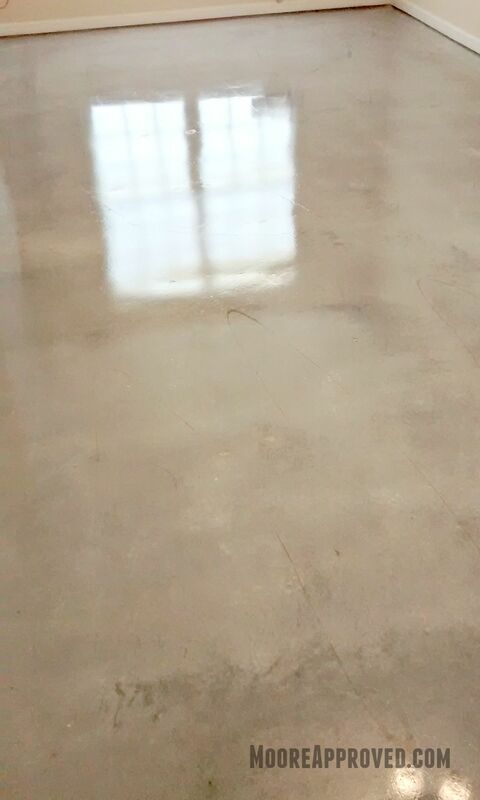 NOTE: Older concrete floors may require an etching solution to prepare the surface of the concrete to accept the sealer and wax. 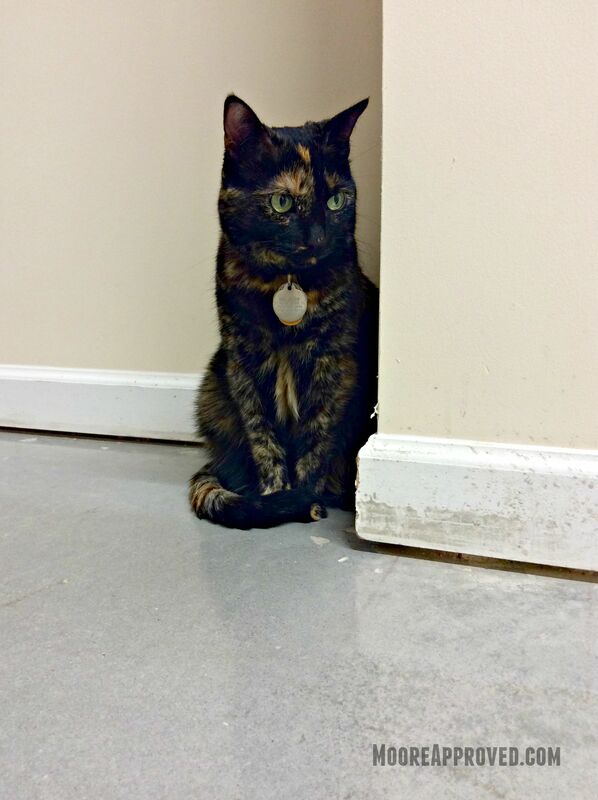 The new concrete floor is Gato Approved. The cat’s behavior in coping with such a dramatic change in floor texture was quite amusing. At first, she would only walk on the outside perimeter of the room out of fear. Then she grew comfortable with her surroundings and now loves to lie on her back and roll around on the floor.